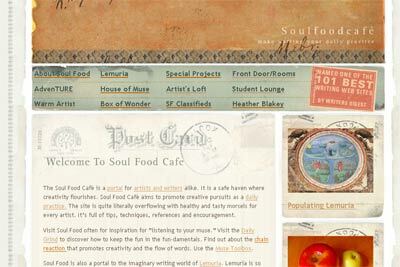 The Soul Food Cafè is a portal for artists and writers alike. It was a safe haven where creativity flourished until it ceased operation in 2010. The Soul Food Cafè aimed to promote creative pursuits as a daily practice. The domain names www.dailywriting.net and www.outbackonline.net still belong to Heather Blakey and they house the Soul Food Cafe and the creative stimuli that the site provides. You will find special projects, serene sanctuaries and work that has been published since 1999. The Soul Food Cafe remains an expansive vault of creative stimuli.The static, Web 1.0 part of this site is still overflowing with healthy and tasty morsels for every artist. You can choose to explore this vault by yourself and take advantage of the innovative prompts and suggestions. No one will ask you what you are doing. There are no officious bunnies that will pop up and say that you should not be using that key or looking behind the small door at the end of the corridor.There is no charge. It is a free resource and will always remain so. At Soul Food, the main place to interact was within the sanctuary that Lemuria afforded. Webmaster, Heather Blakey, quite literally built a target specific, interactive community for people who wanted to practice the Soul Food Way and make writing and art a daily practice. As a result of her work, Soul Food became a place where artists, writers, journalists, photographers, scientists, archaelogists, storytellers, illustrators, musicians living resided. Lemuria grew out of the myth Heather lived by. She first learned about this ancient world in 1980. She discovered, during the late 1880’s, that her great Grandfather, George Chale Watson, wrote a book entitled the Mountain Tops of Lemuria to record his journey on a Black-birding ship through the Polynesian Islands. He believed that these islands were the old mountain tops of Lemuria, the lost southern continent. The Lemurian writing sanctuary was born after Heather Blakey located, at the Queensland University, the only copy of her great grandfather’s book. The University Librarian permitted her to make a copy of it, You will find Watson’s fascinating account of his journey, together with other ancestral material, on the site. 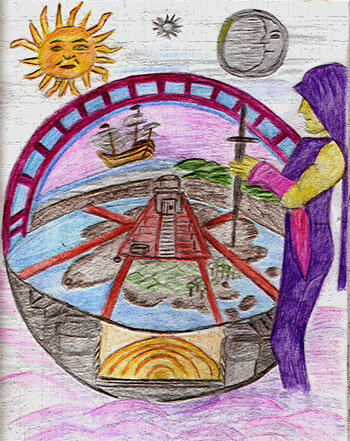 Original adventurers found Heather’s Lemuria by passing through a very special portal and all the stimuli was housed here. At this time Heather used Braveness Forums as a means for people to participate and publish their work and then transferred some of that material on to the site. When the Blogger Revolution came in 1999 Heather created a virtual monastery at Soul Food. In an interview with Chris Dunmire she talked about how she envisioned the Lemurian Abbey as a place full of fine art and craft, a monastery that would be filled with tiny, Spartan cells where votaries of the muse could come, retreat behind walls and observe time differently. She believed that in this Monastery, time would not be measured with clocks and believed that monastic writers would be free to wander through the cloisters and walled gardens in a meditative state, capturing metaphors in their writing nets. The Lemurian Abbey became a wonderful sanctuary for people eager to practice the Soul Food Way. A metamorphosis began to take place and Heather realised that there was something magical happening on the site. A creative transformation was taking place and she could see that interaction and collaboration were working in an online setting. 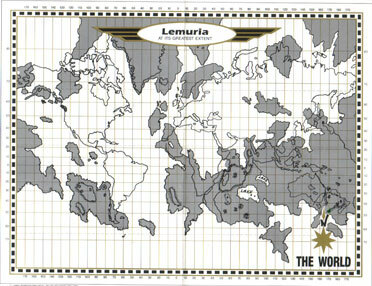 Soon a map of Lemuria emerged and people began to explore previously unexplored parts. Lemuria became a fantasy realm which could be emtered through a magic portal not unlike that which took Alice in to Wonderland or the children in to Narnia. Heather Blakey is an artistic midwife who is in her element when she works with artists and writers to assist in the delivery of their artistic hopes and dreams. She is passionate about nourishing creativity and has, over a ten year period, helped people recover from their formal education, reclaim their imagination and discover their unique voice. The Rookery features the work of a group of inter generational, international, creative women who have worked in Lemuria with Heather Blakey, gaining their 'raven wings' in the process. The Pythian Games is a project involving a collective of international and intergenerational members of the Soul Food Cafe. The Pythian Games demonstrates the potential of making writing a daily practice. It is the brain child of Heather Blakey, Webmaster and creator of Soul Food. The 2006 Adventure Calendar preserved one of the Lemurian Journey's with Enchanteur. The Wild Garden AdvenTURE Calendar takes people through twenty five steps towards understanding how the internet can be used as an interactive publishing tool. It is a comprehensive feature that celebrates work of people within the Soul Food Cafe.